Well, it’s no secret that I love the product coordination that Stampin’ Up! offers. And I love punches, so when there’s a punch or die that easily cuts out the shape of a stamped image, I’m all in! 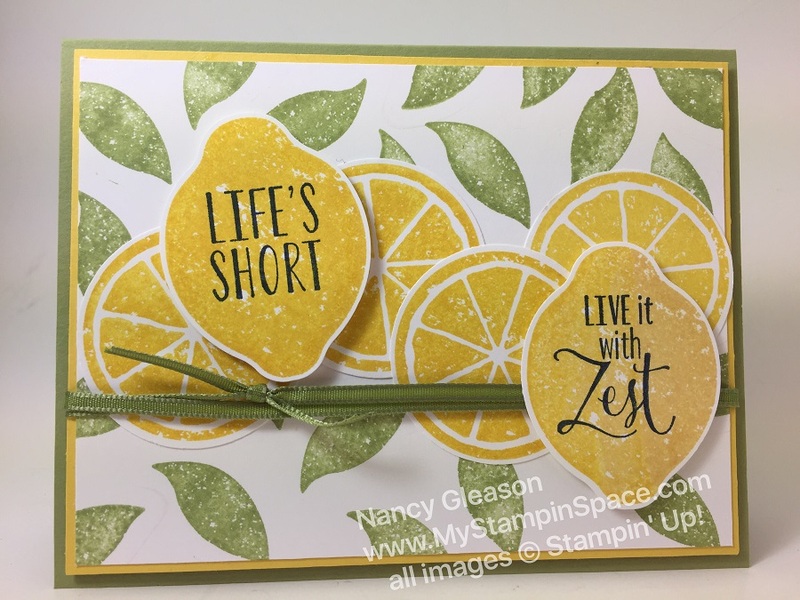 One of the first stamp sets/bundles that I HAD TO HAVE from the 2017/18 Annual Catalog was the Lemon Zest bundle. 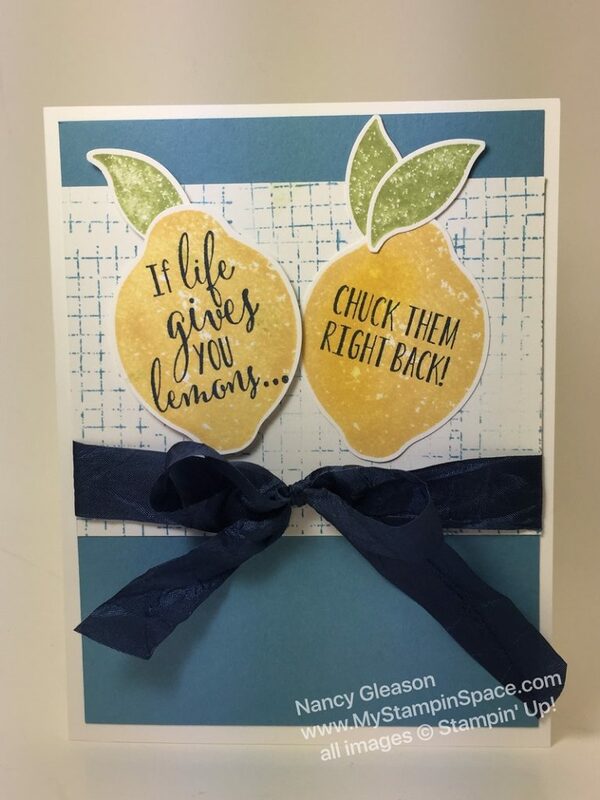 I love these fun, zesty lemons and the sassy sayings that go along with them! The coordinating Lemon Builder Punch makes it (oh, I just have to say it…) “Easy-Peasy, Lemon Squeezy” to cut out the lemons and leaves. The 1-3/4″ circle punch is perfectly sized to cut out the citrus fruit slices. I taught a class Monday night called “When Life Gives You Lemons” and it was centered around the Lemon Zest bundle. I like to teach my students a new technique or a tool, or something that they can use to increase their papercrafting skills. The teachable lesson in this class was to make backgrounds, especially when you might want, but don’t have, a coordinating Designer Series Paper. We used the smaller of the 2 leaves to randomly stamp the leaf onto Whisper White cardstock. The result was a coordinating patterned background that compliments the focal point, the lemons. It’s hard to see in this photo, but the lemon slices are accented with Wink of Stella which gives them a juicy glow! The next card also used a stamp, this one from Timeless Textures, to create a background on our Whisper White panel. I think the blue is the perfect color to compliment the lemons. The Marina Mist is an under-used, but perfect shade of blue for almost any occasion, like denim is a staple in any wardrobe. The dark Night of Navy just pops against the Daffodil Delight of the lemon, and is perfectly accented by the Night of Navy Crinkled Seam Binding Ribbon. I AM IN LOVE WITH THIS RIBBON! ‘nough said! Just buy this crinkled seam binding ribbon in every color! You can thank me after you hold this soft, flowy in your own hands and tie perfectly flawless bows every time. 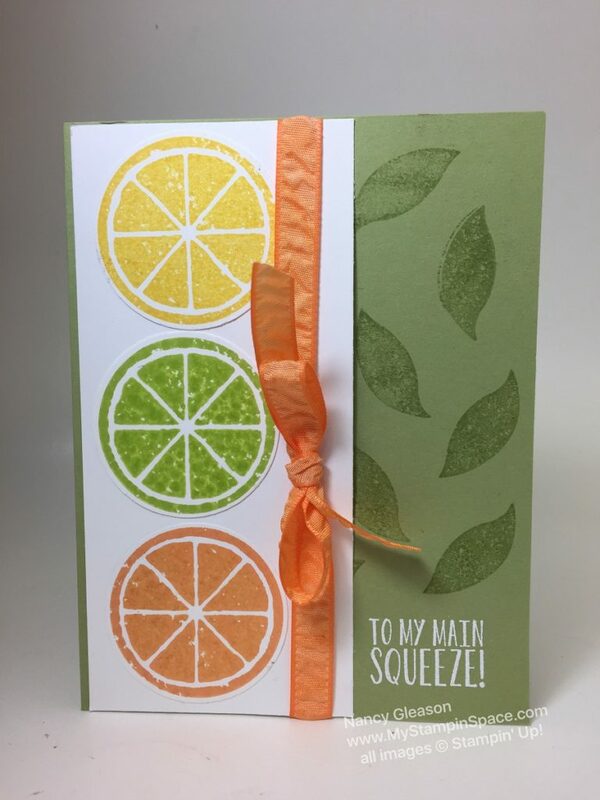 This last card is the first card I made as soon as the Lemon Zest Bundle arrived at my door step! The citrus slices are stamped as Lime, Lemon & Orange slices and have a piece of Peekaboo Peach Ribbon. I used the same leaf to stamp a background as I did in the first card of this post. The sentiment is heat embossed in Whisper White. Of course, “To My Main Squeeze” was meant for my husband! The card didn’t require a special occasion. After writing some sappy, lovey-dovey note inside, I tucked it in his lunch box to brighten his day! A sweet surprise. Cutting out the lemons, the slices and leaves are a breeze with punches. I really think that punches are a must-have for any paper crafter, and definitely for someone just starting out. Basic shapes, like circles, and punches that coordinate with stamps are the best value. Bundling is an even better value when you can save 10%. Well I hope that you like my “cuts”. Please leave me a comment and tell me what you think. 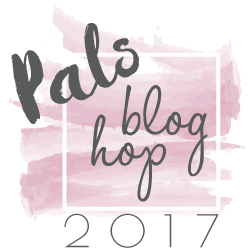 Then hop along and see what other project the Pretty Pals have cut out for you. Come back around and visit me and my blog again. If you don’t currently have a relationship with another Stampin’ Up! demonstrator, and want to order any of the products I showed here, please feel free to shop my online store. Your order will be shipped right to your home. We were in the same camp – The I HAVE TO HAVE THIS BUNDLE camp! Love it and thank you for the inspiration to use it on many, many ways! A true keeper! Nancy, I love how you show the versatility of this stamp set and punch. Your projects are awesome 🙂. Thanks for sharing! I do like my big shot & dies, but I like punches more! The card for your husband is my favorite, I like that layout! Such fun cards — I love the fresh colors you used for this set!! I love blue and yellow so it only seemed appropriate for the lemons. Glad you like my color combos! Great cards! Love how you shared the versatility of the set as well. Great lemon cards! I haven’t added “sugar” to the slices yet. Yours are wonderful! Your citrus cards are so cute! Each of your cards are wonderful…you’ve really shown the versatility of this bundle. This is such a lovely sampling of cards! You sure have made the lemon zet set shine!